Members of the undefeated 2001 Crimson football team show flags at a 2011 tailgate in New Haven. 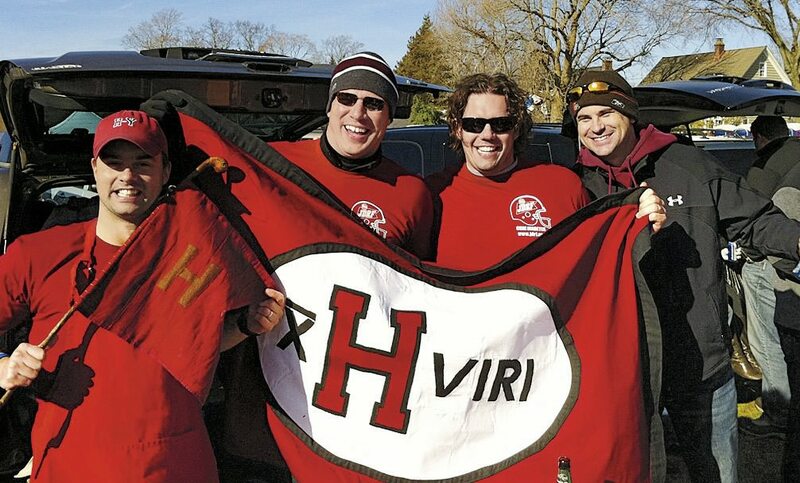 Jared Lewis ’02, far left, holds the ancient Little Red Flag, which has been to many Harvard-Yale football games. He designed the new flag, and Kelly Goff made it. It is brandished, from left, by Justin Stark ’02, Jason Hove ’02, and Samuel Taylor ’02. The iconographic device serving as the headline for this column means “Ten Thousand Men of Harvard.” In the words of the beloved fight song, they want victory today. Polished Harvardian. Few of the 10,000 men have shoes as shiny as the left shoe of the statue of John Harvard in the Yard. 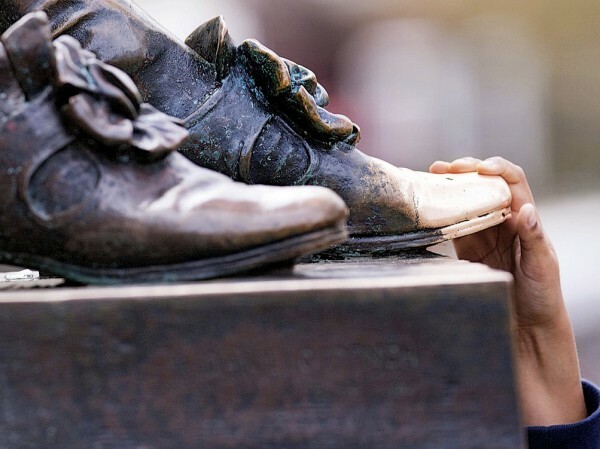 Tour guides instruct tourists to rub that shoe for luck, and rub they do. Artist and writer Sylvia Maynard ’44 of Cambridge attended her seventieth reunion last June and subsequently reflected on John’s toe-coverings. While posing for the camera so. Will rub that left shoe to a shine. Yea, till the stock of the Puritans wither. Won’t somebody shine his other shoe?